An array of materials from the Sidney L. Matthew Bobby Jones collection and research files. Photo by Paige Knight, courtesy Emory Libraries at Emory University. 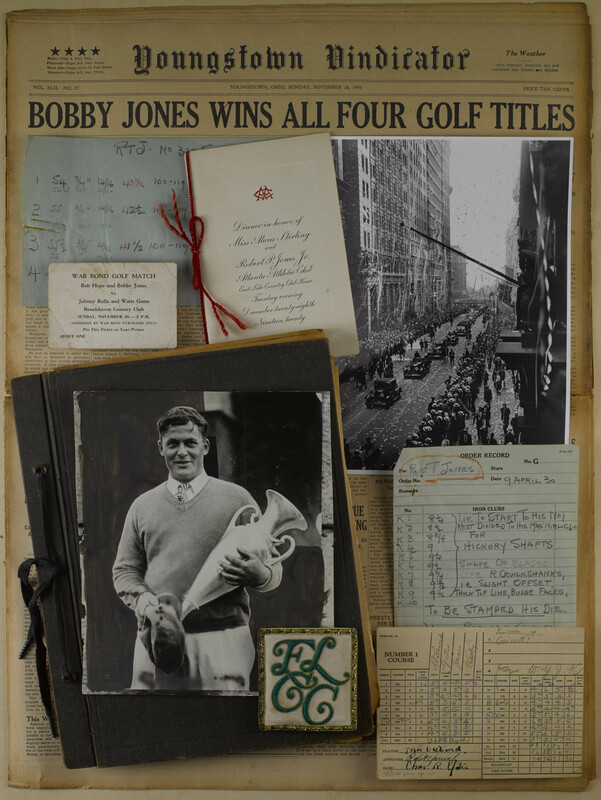 Emory University's Manuscript, Archives, and Rare Book Library (MARBL) has acquired the research collection of Sidney L. Matthew, the leading living historian of golf legend Bobby Jones. The collection is processed and available for researcher use. Matthew, a Tallahassee, Fla., attorney, has written or edited 10 books, produced an hour-long documentary, and written magazine articles about Bobby Jones for Golf, Golf Digest, Links, British Golf Monthly and British Golf World. The collection represents 25 years of research. He conducted much of his research using MARBL's Bobby Jones collection, which was first placed with the library (known then as Special Collections) in 1967. Jones (1902-1971), an Atlanta native, is considered the greatest amateur golfer in history. He won the Grand Slam of golf in 1930 and co-founded the Augusta National Golf Club in 1931, where he played his first Masters Tournament in 1934. The Sidney L. Matthew Bobby Jones collection and research files is a large one – more than 86 boxes – and consist of photographs, newspapers, magazines, scrapbooks, correspondence, memorabilia and video recordings, as well as the research files Matthew used for his articles and biographies about Jones. Upcoming events are planned around the material, including a conversation in May with Matthew and Gue and a major exhibition of Bobby Jones material from both the Bobby Jones and Sidney Matthew collections in January 2015. A collection of Bobby Jones' writings from 1927 to 1935, when Jones wrote regular newspaper columns such as “Bobby Jones Says,” “My Theories of Golf” and “Secrets of the Master.” The columns were distilled into a book titled “Bobby Jones on Golf,” first published in 1966. A scrapbook that belonged to journalist and Jones friend O.B. Keeler, containing news clippings and cruise menus from Keeler's trips overseas with Bobby Jones and the Walker Cup teams. Jones attended Emory's law school but did not graduate, because he passed the bar after just a few semesters. But the relationship with Emory continues; MARBL holds the collections of Bobby Jones and Sidney Matthew, as well as the papers of Atlanta Constitution publisher Ralph McGill and Coca-Cola executive Robert W. Woodruff, both friends of Jones. Emory University Archives in MARBL contains materials related to the university's legal ethics lecture series, named for Jones, and the annual Bobby Jones Scholarship program at Emory, which Woodruff helped establish, Gue says. Matthew says he placed his papers with Emory because he wants scholars and researchers to experience the same access to his research files that he enjoyed with MARBL's Bobby Jones collection. For more information about the Sidney Matthew collection, contact the MARBL staff at marbl@emory.edu or 404-727-6887.